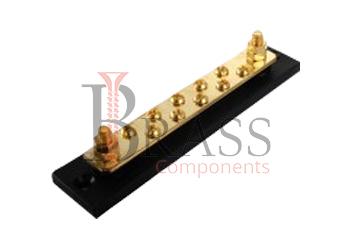 Euro Style Terminal Blocks are manufactured from brass, aluminium, copper, stainless steel, polymer, polyamide or any material composition as per custom specification. Euro Style Terminal Blocks design consist of fixed mount terminal block and push button for wide variety of industries and applications. The standard range of Euro Style Terminal Blocks are also available with spring tension contact, retention screws, mounting flanges and rear barrier. They are available in variety of mating option including horizontal, vertical, left angle, right angle and more. The manufacture range of high quality and standard Euro Style Terminal Blocks are available with various type of coating and finishing including Nickle plated brass, chrome, zinc, electrolyte tin, copper or any as per custom specification and requirements. Available with Screws and contacts which are recessed within the housing to prevent short circuit. Available in multiple pole option. Push button designed for push-in terminations of solid or stranded wire. Provide vibration proof and long term connection. Corrosion Resistance and Abrasion Resistance. Provide Reliable, Durable and convenient wire terminations for wide variety of industries and applications. Solderless Euro Style Terminal Blocks. Provide flexibility to suffice the design requirement as per custom specification. High Temperature compatible versions are also available. Widely used in Industrial Controls, Communication Equipment, Test and measurement equipment. Ideal for used in corrosive environments. Widely used in High power industrial applications. Provide connection and disconnection at field installation. We manufacture Euro Style Terminal Blocks as per Custom Specification and export in France, Italy, Switzerland, Poland, Greece, UK and other European Countries. For more Information, Please Contact Us or Inquiry Now.